– Not an ideal solution when using a lot of private mode VDisks (VDisk is continuous in use and cannot sync). Luckily we now have the Personal VDisk option in XenDesktop so IMHO private VDisks aren’t really necessary anymore in a SBC or VDI deployment. Because one size doesn’t fit all, you can always mix storage types for storing VDisks depending on your needs, but for Standard mode images combined with caching on the device hard drive or device RAM using the local storage of the Provisioning Server is a good option. This is one of the most important things to deal with, DFS-R uses the last writer wins mechanism to decide which file overrules others. It’s a fairly easy mechanism based on time stamps : whoever changes the file last wins the battle and will synchronize to the other members, it will overwrite existing (outdated) files! Imagine you’re environment looks like the image below. Because you want to update the image, you connect to the Provisioning console on PVS01 and create a new VDisk version, this will create a maintenance (.avhd) file on PVS01. Because this file is initially very small it will quickly replicate to the other Provisioning servers. You spin up the maintenance VM, at this point you don’t know from which Provisioning server the maintenance VM will boot (decided based on load balancing rules), so let’s say it boots from PVS03. You make changes to the maintenance image and shut it down. Now the fun part is going to start! Based on the changes you made and the size of the .avhd file, it can take some time to replicate the updated file to the other Provisioning Servers. In the meantime, still connected to PVS01, you promote the VDisk to test or production. When you promote the VDisk, the SOAP service will mount the VDisk and make changes to it for KMS activation etc. You boot a test or production VM from the new version, and you don’t see you’re changes, further more they are lost! The promote takes place on the Provisioning Server which you are connecting to, so in the example this is PVS01. PVS01 doesn’t have the updated .avhd from PVS03 yet, so you promoted the empty .avhd file created when you clicked on new version. Because the promote action updates the time stamp of the .avhd file, it will replicate this file to the other Provisioning server (again quick because it’s empty) overwriting the one with your updates. After you make changes wait till the replication is finished (watch the replication tab in the Provisioning console) promote the version when every Provisioning Server is in sync. Below I will give some other practical tips when using DFS-R to replicate your VDisk stores. 7. Before you start check your Active Directory scheme and domain functional level, if you want to use DFS-R your Active Directory scheme must be up-to-date and support the DFS-R replication objects. Also note that only DFS-R replication is necessary, no domain name spaces are needed. I can be very short here, my conclusion is that DFS-R can be a very nice and convenient way to keep your VDisk stores in sync, but you must understand how DFS-R replica works and how it behaves when combined with Provisioning Server. 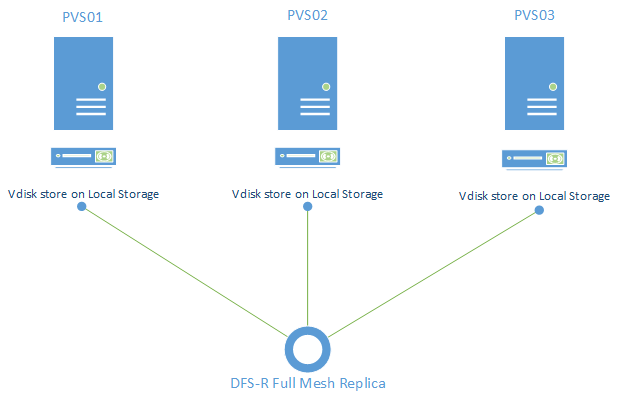 Hopefully this blog post gave you a better understanding when using DFS-R in combination with Provisioning Server and keep above points in mind when you consider using DFS-R as the replication mechanism for your VDisk stores.